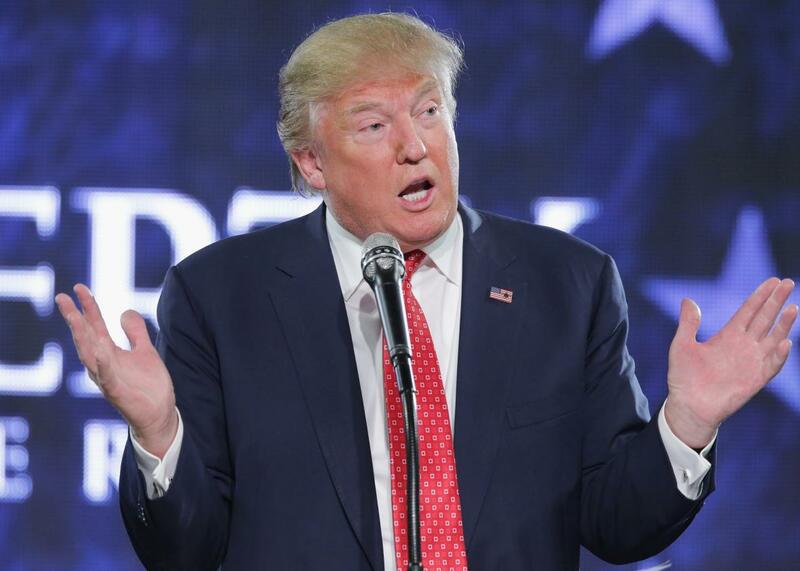 Donald Trump is the only serious GOP candidate who hasn’t promised to rip up the Iran deal. Is Donald Trump the Only Leading Republican We Can Trust on Iran? The Republican front-runner is the sole serious GOP candidate who hasn’t promised to rip up the Iran deal on Day One. Donald Trump speaks at Liberty University on Jan. 18, 2016, in Lynchburg, Virginia. The next Republican nominee for president, in all likelihood, will be Donald Trump, Sen. Ted Cruz, or Sen. Marco Rubio. Two-thirds of Republican voters support one of these three candidates. In nearly every Iowa poll, Trump, Cruz, and Rubio lead the pack. In political betting markets, they’re drawing about 90 percent of the money. Cruz says the nomination is a two-man race between him and Trump. You might not love me, says the Texas senator, but I’m the only guy left who can beat Trump and save the GOP from disaster. Rubio offers a similar pitch: He’s the electable Republican, the only alternative to a lousy choice between Trump and Cruz. The argument for Cruz or Rubio, in short, is really an argument against Trump: He’s reckless, he’s dangerous, he says crazy things. But there’s a problem with this rationale. As both senators have noted, the most important thing a president can change by himself is foreign policy. In this case, he can revoke American participation in the biggest nuclear nonproliferation pact in almost 20 years: the 2015 agreement between six countries and Iran, which was formally implemented this weekend. And on that issue—the one that arguably matters most—Trump isn’t crazy. Of the three leading Republicans, he’s the only one who hasn’t promised to revoke the Iran deal on his first day in office. I’ve heard a lot of people say, “We’re going to rip up the deal.” It’s very tough to do [that] … Because I’m a deal person. And when I make deals … I will police that deal. You know, I’ve taken over some bad contracts. I buy contracts where people screwed up, and they have bad contracts. But I’m really good at looking at a contract and finding things within a contract that, even if they’re bad, I would police that contract so tough that they don’t have a chance. … And the problem is, by the time I got in there, they will have already received the $150 billion. Trump was right. Revoking U.S. compliance made no sense. The agreement’s smartest critic, Republican Sen. Bob Corker of Tennessee, explained in July that by the time a new U.S. president took office, “the international sanctions process would have been totally dismantled.” The president could restore American sanctions but not the joint European-Russian-Chinese–United Nations sanctions that had forced Iran to the bargaining table. Iran would have its money, and the Europeans would be in no mood to follow a unilateral American withdrawal from a complex agreement everyone had painstakingly negotiated. Worse yet, Iran would be free to resume its pursuit of nuclear weapons. The Iranian government, which so far has complied with the agreement, could point to the American withdrawal and announce that the deal was off. Russia and China would be able to say that they had tried to help the West reach a responsible agreement but that the Americans had broken it, and therefore further sanctions were pointless. Even in Europe, the United States would get the blame. And the damage wouldn’t end there. As Cruz has pointed out in the case of Libya, when regimes don’t get rewarded for relinquishing their nuclear weapons programs, other countries aren’t likely to offer the same concessions. Last month, Cruz complained that the Obama administration had turned against Libyan dictator Muammar Qaddafi after he “voluntarily handed over his nuclear program and shut it down.” In an interview with MSNBC’s Joe Scarborough, Cruz repeated this point and commiserated over the counterproductive message Obama had thereby sent to other regimes. The far better approach is the one Trump described: Police the deal. Use the elaborate compliance requirements and punitive measures with which the Iran agreement is loaded. If Iran fails to meet any of these terms, cite the text and bring the pain. Keep the Europeans on our side, and hold the Russians and Chinese to their word. The best scenario is that Cruz and Rubio are lying: They’re throwing red meat to crowds, fully intending to betray their promises. The worst scenario is that they’re serious. Either way, their recklessness on a matter of such gravity is damning. The GOP may soon face a choice between a businessman who understands the importance of honoring deals and two freshman senators who don’t. To save the party from dangerous fools, Republicans might have to nominate Trump. Katherine Kwok and Anna Weber provided research assistance for this article.